Oscar Octopus is hand made in the finest multi-coloured cuddly soft plush and wears the famous Steiff Button in Ear and carries the yellow ear tag. 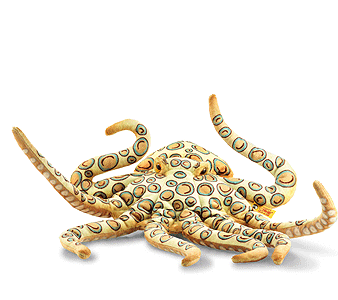 The 46 cm wide, colorful Oscar Octopus is a happy playmate. The eyes and the tips of the arms are airbrushed in orange and brown. The back of the head adapts with its caramel tone in color. The elaborate All over Print is in turquoise and brown at the front, in cream and brown at the back. A colorful and very cuddly soft plush octopus.